Fashion Treasure Hunting Alert, Thrift Trader North Park is Closing! One of my favorite places to get a great deal is closing. Located across from my favorite vegan restaurant: Moncai Vegan, I would treat myself to a healthy lunch and then go across the street and treat myself to a dress or a top or a jacket. The majority of my treasures were purchased for $5.99 or 4 for $20.00. There were so many, a vintage Nicole Miller black lace dress, a Vivienne Tam dress, a vintage jacket from Paris, ah the memories! This location is in a huge warehouse, with two floors selling clothing, accessories and vinyl! My kind of Disneyland! Going on now until they close everything is on sale and I purchased this vintage Escada dress in perfect condition for $3.99. 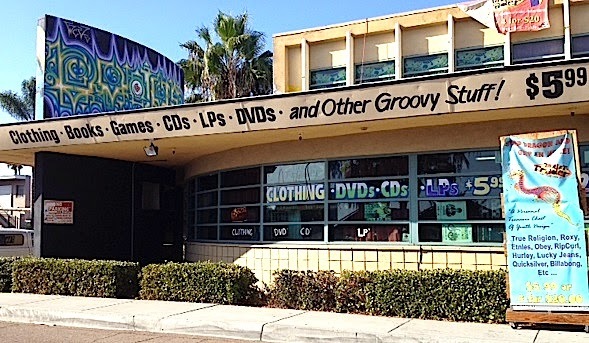 I guess I will have to go to the other two smaller Thrift Trader locations, in Ocean Beach and on El Cajon Blvd. They will keep restocking the store until they close in a little over a month so if you get the chance check it out I always find something wonderful! 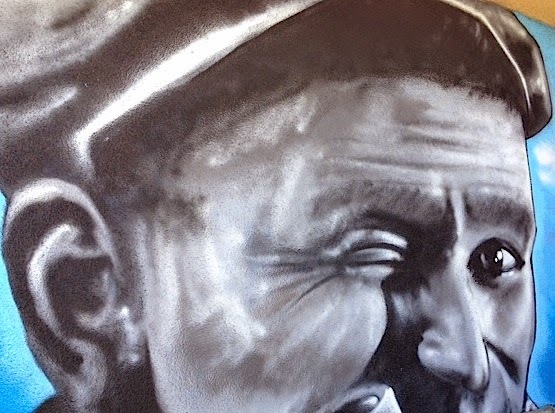 It is sad that the building will be torn down and North Park will lose some nice murals, one of my favorites: Robin Williams as Popeye shown below. The rush is on, January clearance sales at every store, at every mall across America (and probably the majority of the earth)! While Christmas shopping I saw some items that I liked (and really didn't need )were on sale at Topshop and I decided to take my chance and wait until after the holidays to see if they would be reduced further. I was rewarded when I went back to return a shirt I had gotten my son (he said it made him look Amish, I guess it was too fashionable for him) and was able to purchased the Embroidered Duster jacket that I had my eye on for less than the returned shirt. I'm easier to shop for anyway! I decided to give myself a challenge. I would shop at the Forever 21 store, their 30% off sale section and see if I could find a great deal for someone "over 21". Forever 21 is an overwhelming store, overflowing with almost every garment you could imagine. A sea of clothing that id difficult to maneuver, the store is famous for knocking off almost every designer. 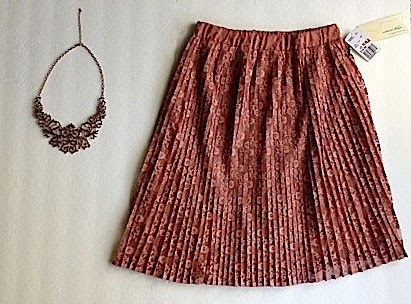 I was able to find a beautiful lace pleated skirt, very nice quality for $8.39 that hits mid knee and a lovely bronze necklace for $2.09. They always seem to have something for everyone and it is a great place to get something fun to add to your wardrobe without a lot of expense!